Hi! I am looking for a plush blue puppy dog with a white tummy and patch around his eye. It also has white “baseball” stitching. I think it was sold at Walmart. We got it as a shower gift in February, 2006. My son is in LOVE with this “baby”, and the dog is starting to look really worn. I’d love to find one now before he falls to pieces!! 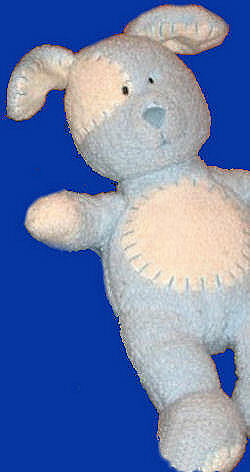 If you can help Megan find this blue puppy with baseball stitching, THIS SITE IS NO LONGER ACTIVELY MANAGED. Please use Our FREE FACEBOOK GROUP, including #022808-1 in the subject, . THANK YOU!! I was so busy trying to get caught up with all the requests that I never even thought to question if it was a rabbit or not. I also see that people describe this as being a PATCHWORK puppy. Good to know if I need to look for another animal like that. I emailed her several of the listings on eBay, all thanks to you, Tami!! Well my good friend, there would be no need to thank me if you didn’t have this wonderful site! Hello. Just in case you need another one. Here is a link to one on ecrater.